12V 12Ah F2 BATTERY PRIDE JAZZY POWER CHAIR Z-CHAIR - 4 Pack. 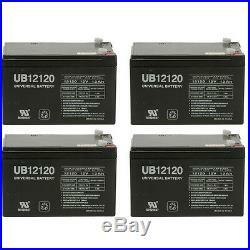 UPG - UB12120 12V 12AH Sealed Lead Acid Battery (SLA). UPG # D5775 UB12120 12V 12Ah ; Dimensions: 5.94 inches x 3.88 inches x 4.06 inches. Valve regulated, spill proof construction allows safe operation in any position. Consumer Electronics, Electric Vehicles, Engine Starters, Golf Carts, Hunting, Lawn and Garden Tools, Medical Mobility, Motorcycles, Photography, Power sports, Portable Tools, Solar, Toys and Hobby, Access Control Devices, Emergency Lighting, Security. Is a sealed lead-acid (SLA) absorbed glass mat. And GEL batteries are lead-acid and of the same battery chemistry. This battery comes already charged, sealed, maintenance free, and ready to install. Premium quality absorbed glass mat technology. Is ideal for ATVs, motorcycles, personal watercraft, snowmobiles, UPS systems, alarm systems, exit lighting systems, wheelchairs and more. COMPATIBLE WITH THE FOLLOWING AND MORE. Spitfire 1310 (Requires 2 Batteries). Comp 450 (Requires 2 Batteries). Spitfire EX 1420 (Requires 2 Batteries). Street 2 (Requires 2 Batteries). Street 450 (Requires 2 Batteries). Electric Sport (Requires 2 Batteries). Comp II (Requires 2 Batteries). Transport 450 (Requires 2 Batteries). S 450 (Requires 2 Batteries). Street II (Requires 2 Batteries). · Bruno Rio Travel Scooter (Requires 2 Batteries). SE 450 (Requires 2 Batteries). · E-Scooter 24 Volt 250 Watt (Requires 2 Batteries). · E-Scooter 36 Volt 350 Watt (Requires 3 Batteries). · Electra Scoot-N-Go (Requires 2 Batteries). · Drive Medical Falcon 3 (Requires 2 Batteries). · Drive Medical Falcon 4 (Requires 2 Batteries). · Freedom 644 Electric Scooter (Requires 2 Batteries). · Drive Medical Geo_Portable (Requires 2 Batteries). · Drive Medical Mini Phantom (Requires 2 Batteries). · Drive Medical Phantom (Requires 2 Batteries). · Drive Medical Phoenix 3 (Requires 2 Batteries). · Drive Medical Phoenix 4 (Requires 2 Batteries). · Frank Mobility E-Fix (Requires 2 Batteries). · Mongoose AL 1020 (Requires 2 Batteries). · Pride Mobility Go Go (Requires 2 Batteries). · Pride Mobility Sonic (Requires 2 Batteries). · Quickie Melody (Requires 2 Batteries). · Mongoose Dirt Grinder (Requires 2 Batteries). · Rascal We Go 250 (Requires 2 Batteries). · Rascal We Go 255 (Requires 2 Batteries). Dasher 3 (Requires 2 Batteries). Dasher 4 (Requires 2 Batteries). · Shoprider Scootie Jr (Requires 2 Batteries). · Rad2Go Rocket Racer (Requires 3 Batteries). · Shoprider Start (Requires 2 Batteries). · Rad2Go ZZ Cruiser (Requires 2 Batteries). · Shoprider Sunrunner S (Requires 2 Batteries). · Rad2Go ZZ Rider (Requires 2 Batteries). · Sunrise Medical Guardian Trek 3 (Requires 2 Batteries). · Razor E500s (Requires 2 Batteries). · Sunrise Medical Guardian Trek 4 (Requires 2 Batteries). · Razor MX500 Dirt Rocket (Requires 3 Batteries). · Theradyne EV1864 (Requires 2 Batteries). · Razor MX650 Dirt Rocket (Requires 3 Batteries). · Zip'r Zip'r3 Traveler (Requires 2 Batteries). · Zip'r Zip'r3 Xtra Hybrid Traveler (Requires 2 Batteries). · SEA-DOO SeaScooter VS Supercharged. · Zip'r Zip'r4 Traveler (Requires 2 Batteries). · Sola 350 Cruiser (Requires 3 Batteries). · Zip'r Zip'r4 Xtra Hybrid Traveler (Requires 2 Batteries). · Sola X-11 (Requires 2 Batteries). · SunL Big Bug (Requires 2 Batteries). · SunL E-21 (Requires 2 Batteries). · SunL ES-40 (Requires 3 Batteries). · SunL SLE-380 (Requires 2 Batteries). · RBC Battery Cartridges RBC3. · SunL SLE-500 (Requires 2 Batteries). · RBC Battery Cartridges RBC4. · SunL SLE-750 (Requires 3 Batteries). · APC BACK-UPS 1000 (Requires 2 Batteries). · SunL Tiger (Requires 2 Batteries). · X-Treme X-11 (Requires 2 Batteries). · APC BACK-UPS 650 Pro. · APC BACK-UPS BK1000 (Requires 2 Batteries). · X-Treme X-360 (Requires 3 Batteries). · X-Treme X-50-300 (Requires 2 Batteries). · X-Treme X-560 (Requires 3 Batteries). · X-Treme X-600 (Requires 3 Batteries). · X-Treme XA-750 v1 (Requires 3 Batteries). · X-Treme XB-500 (Requires 4 Batteries). · APC BACK-UPS ES BE750-CN. · X-Treme XB-502 (Requires 4 Batteries). · APC BACK-UPS ES BE750BB. · X-Treme XB-508 (Requires 4 Batteries). · APC BACK-UPS LS BP650S. · X-Treme XM-500 (Requires 3 Batteries). · APC BACK-UPS PCNET (Requires 2 Batteries). · X-Treme XP-700 (Requires 3 Batteries). · APC BACK-UPS PRO BP1000 (Requires 2 Batteries). · Xcooter Xcruiser XC266GTB (Requires 2 Batteries). · APC BACK-UPS PRO BP650. · Xcooter Zipper XC533GTG (Requires 2 Batteries). · APC BACK-UPS PRO BP650C. · APC BACK-UPS PRO BP650IPNP. · APC BACK-UPS PRO BP650PNP. · APC BACK-UPS PRO BP650S. · APC BACK-UPS PRO BP650SC. · APC BACK-UPS PRO BP650SUS. · APC BACK-UPS PRO BP650SX107. · APC BACK-UPS VS SUVS1000 (Requires 2 Batteries). · APC BACK-UPS VS SUVS650. · APC SMART-UPS 1000 (Requires 2 Batteries). · APC SMART-UPS 1000NET (Requires 2 Batteries). · APC SMART-UPS 1000RM (Requires 2 Batteries). · APC SMART-UPS RM SU1000RM (Requires 2 Batteries). · APC SMART-UPS RM SU1000RMNET (Requires 2 Batteries). · APC SMART-UPS RM SU1500RMX155 (Requires 2 Batteries). · APC SMART-UPS RM SU2000R3X155 (Requires 4 Batteries). · APC SMART-UPS SU1000 (Requires 2 Batteries). · APC SMART-UPS SU1000 RACK (Requires 2 Batteries). · APC SMART-UPS SU1000BX120 (Requires 2 Batteries). · APC SMART-UPS SU1000NET (Requires 2 Batteries). · APC SMART-UPS SU1000RM (Requires 2 Batteries). · APC SMART-UPS SU1000RMNET (Requires 2 Batteries). · APC SMART-UPS SU1000X127 (Requires 2 Batteries). · APC SMART-UPS SU1000X93 (Requires 2 Batteries). · APC SMART-UPS SU700X167 (Requires 2 Batteries). · APC SMART-UPS SUA1000 (Requires 2 Batteries). · APC SMART-UPS SUA1000US (Requires 2 Batteries). · APC SMART-UPS SUVS1000 (Requires 2 Batteries). · Belkin BERBC55 (Requires 2 Batteries). · Belkin F6C1000-EUR (Requires 2 Batteries). · Belkin F6C320 (Requires 4 Batteries). · Belkin Omnigaurd 3200 (Requires 4 Batteries). · Belkin Pro F6C100 (Requires 2 Batteries). · Belkin Pro NETUPS F6C100 (Requires 2 Batteries). · Belkin Regulator Pro Net 1000 (Requires 2 Batteries). · Data Shield AT5000 (Requires 2 Batteries). · Data Shield TURBO 2-450. · Elgar SPS1000 (Requires 4 Batteries). · Emerson 800 (Requires 2 Batteries). · Emerson AU-750-60 (Requires 3 Batteries). The item "UPG 4 Pack 12V 12Ah F2 BATTERY PRIDE JAZZY POWER CHAIR Z-CHAIR" is in sale since Thursday, April 17, 2014. This item is in the category "Consumer Electronics\Multipurpose Batteries & Power\Rechargeable Batteries". The seller is "ecomelectronics" and is located in Brooklyn, New York. This item can be shipped to United States.